A corset from the Symington Fashion Collection, part of Harborough’s heritage. The Symington Building is famous for being a former corset factory, run by R & WH Symington & Co Ltd. 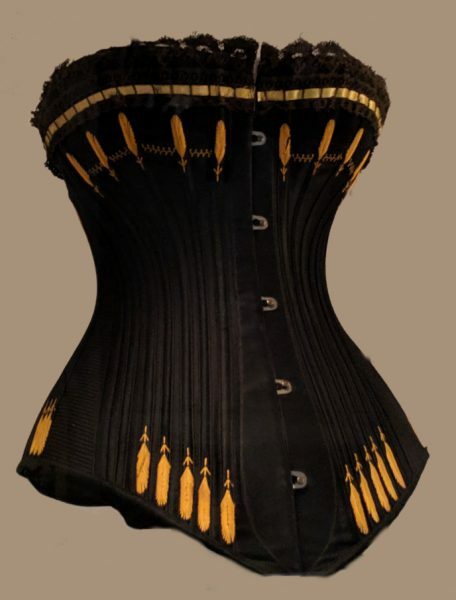 In Harborough Museum you can see several of their products including this black sateen corset from 1890, a maternity corset and the famous Liberty Bodice. In the early 1860s R & WH Symington began to mass produce corsets in the disused carpet factory that was formerly opposite The Symington Building. By the 1950s they had factories in Canada, South Africa and Australia, making them a global fashion brand. The Liberty Bodice, a fleecy vest for children, launched in 1908. It was either a love-it or hate-it piece of clothing for children but went on to be one of the company’s best-selling products. Black sateen corset with gold feather ‘flossing’ and ribbon-slotted lace, 1890. See it in the Introduction to the Town case. In the early 19th century, James and William Symington both moved from Lanarkshire, Scotland to Market Harborough. William set up a tea, coffee and grocery business and James was a tailor, hatter and draper next door. As his business grew, William moved premises and rented his old shop to Mrs Gold, a staymaker and her daughter Sarah. Today this is used by Clintons the card shop. James married Sarah and they added a new skill to the business, with Sarah as a seamstress. Sarah then set up a workshop employing 3 assistants to help her make corsets. Their eldest son, Robert, one day returned from America with a Singer Sewer machine. At first workers at the workshop were unsure of them but took up the new machines. In 1861 Robert and his brother, William Henry, took over part of a former carpet factory, growing the business with new innovations such as steam power, which helped to increase production. By 1876 they bought the rest of the factory and a few years later began exporting to Australia, Africa and North America. During the twenieth century, the company expanded their ranges with Avro and Liberty foundationwear, as well as the famous Liberty Bodice. In 1967 the company was taken over by Courtaulds, producing garments for other reatilers such as Marks and Spencer. Production finally stopped in 1990, as manufacturing declined in the UK.